Travel has been an integral part of the Waring experience since the early days of the school. Travel promotes intellectual and individual growth as well as engenders curiosity. On Waring trips students are exposed to history, art, and culture. They are asked to observe, sketch, and write about their experiences and to relate them back to Waring's curriculum. Waring trips are a direct extension of many Waring programs and are designed to enrich, make real, and deepen our students’ studies as well as to allow for learning that could happen no other way. Travel removes the classroom from the act of learning and shows students that it can happen everywhere. Travel at Waring follows an intentional arc beginning with Camping Trip, where the whole school is away for three nights together every September. The arc continues with the two-night trip to Montreal for Core (Grades 6 and 7), the four-week exchange in Angers, France, for Group 2 (Grade 9), and culminates in the three-week Junior Trip. Each trip has slightly higher expectations and demands, taking the students a little further away from home and entrusting them with more independence and responsibility. Many Waring students also travel as part of their coursework. For example, there have been many Group 1 (Grade 8) trips to Washington, D.C. and several Endterm groups travel each year. Waring travel has personal as well as academic goals. Students learn to think about the needs of the group and to try things that pull them outside of their comfort zones. In the process, their relationship with the group and their teachers is strengthened. The Montreal Trip is a three day, two night trip that Core takes each spring. The students visit the Biodôme and art museums, they eat at restaurants of varied cuisines, and they hear French spoken in everyday situations. They share space with classmates in a youth hostel for two nights and are challenged by being away from the comforts of home. The trip is an enriching growth experience that deepens the students’ understanding of their coursework and helps them develop the skills and habits they will need to participate in future Waring trips. Waring’s Homestay Exchange Program with the Lycée David d’Angers is central to the Waring Experience. In October, Waring ninth graders host French students for three and a half weeks. In March our students journey across the Atlantic to spend a month living with the family of the same student in Angers, France, approximately 180 miles west of Paris. The program is designed as an immersion in both French culture and language. It benefits all levels of French students, from those who have been studying the language for several years to those with no previous experience. This program increases students’ fluency and comprehension and gives them real experience of another culture. Although language acquisition is a major goal, there are other purposes to the trip as well. 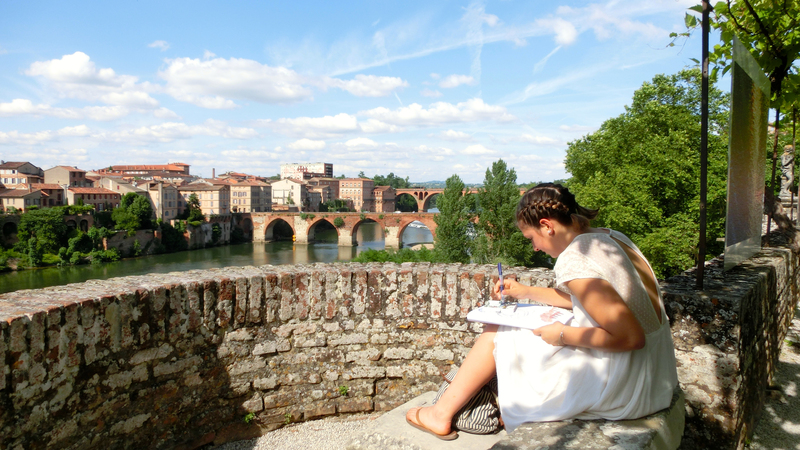 While in France, every effort is made to enhance the humanities, art, math, science, and music programs. math and science courses continue while we are in France and are enriched by local resources such the biotechnology teaching laboratory, L’Ecole de l’ADN. For humanities, destinations are chosen for their connection to the year’s curriculum: the Mont Saint Michel, Notre Dame, and the Musée de Cluny (Musée National du Moyen Âge Paris) for Medieval Europe; and World War I and II sites in northern France when they are studying Modern Europe. Parents regularly notice and appreciate the increased maturity, independence, and awareness that their children acquire through having to adapt to the rhythms of another family and to travel as a member of a group. At the conclusion of the program, the students, host families, teachers, and administrators celebrate the relationships formed during the course of the year. These relationships often endure well past ninth grade and allow students to make the study of French and France a life-long experience rather than just an academic class. The Waring School Junior Trip has been a tradition at the school since 1982 and was an expression of the Warings’ belief that travel promotes intellectual curiosity and individual growth. The trip takes place in June as the students are preparing to become senior leaders. The trip is an extension of the curriculum and students spend time writing and sketching as well as giving presentations about the sites they visit. In recent years classes have visited France, Italy, Switzerland, and Germany, as well as a trip across America. Junior Trip allows our older students to feel personal ownership of a city, a culture, and a language. Paris is always a significant part of the trip, and students visit a variety of museums and other cultural sites. All of the experiences reflect parts of our program, including visits that relate to the humanities and visual and performing arts programs. Students are allowed to become independent and exercise their language skills, gaining confidence in their ability to navigate a foreign city with a degree of comfort that very few tourists attain. Junior Trip emphasizes personal responsibility and fosters leadership skills and awareness of the needs of the group. On the last night of the trip, students reflect on their experience together and are officially recognized as the new school leaders.